Peter and Julia van Tongeren have owned Mill Orchards since 1987 when they took over from the previous owners Donald and Frances Hildick Smith. It is a 15ha farm growing some 10ha of top fruit and small areas of gooseberries and a vineyard. The farm nestles on the southerly slopes of the Abberley Hills in north Worcestershire where we grow a wide basket of apple varieties from old ones such as Lord Lambourne and Laxton Fortune to the modern commercial ones including Junami, Red Windsor, Gala and Braeburn. We also grow Bramley cooking apples on a semi intensive scale as well as the 3 main pear varieties, Conference, Comice and Concord. The farm over the last 20 years has produced its own award-winning apple juice sold to local outlets and has recently started selling its wine. 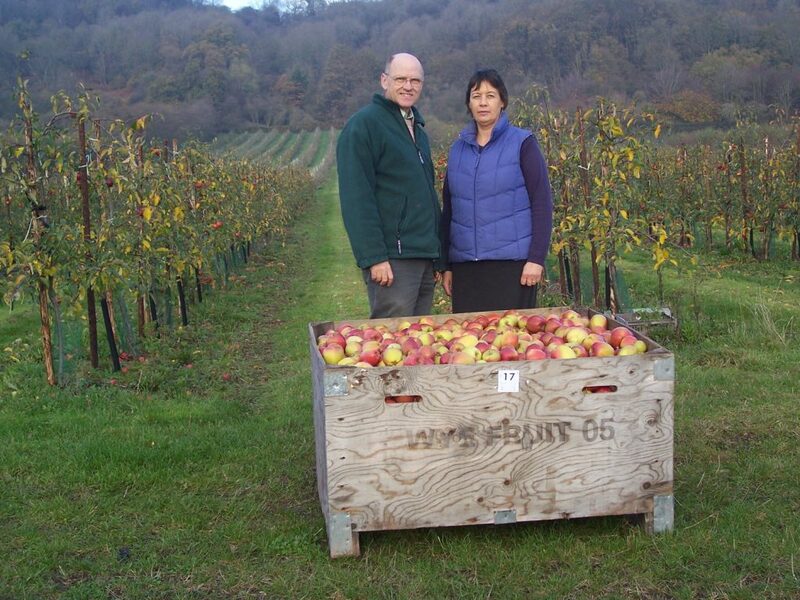 Peter studied Commercial Horticulture at Writtle College and Julia is a retired nurse now working part time on the farm dealing with the apple juicing operation. We have 2 boys, the oldest of which would like to join the farm when he has finished working and travelling abroad. Our other son has started work for British Airways after completing an honours degree at university. Their farm policy is to grow fruit in the most environmentally friendly way possible with a care to surroundings and all the flora and fauna that go with it. There are areas of grass fields on the farm to attract insects and areas of woodland surrounding and on the farm which harbour predators as well as pests. They have grown their own fruit with an integrated pest management system for over 25 years. All fruit is stored and marketed through Wye Fruit Ltd.